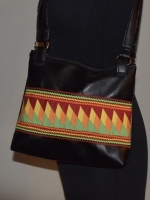 This cross body bag includes snake jaw patchwork in the colors of wine, light pink, white, and black. The inside lining in cotton in a houndstooth pattern. 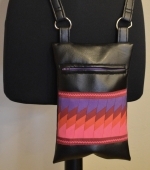 This cross body bag includes snake jaw patchwork in the colors purple, plum, red, and hot pink. 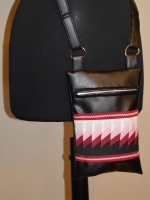 The base of the purse is black and he zipper is purple.